Let's face it, every animal you get as a pet from a small little goldfish to a large horse need supplies to be comfortable and safe. 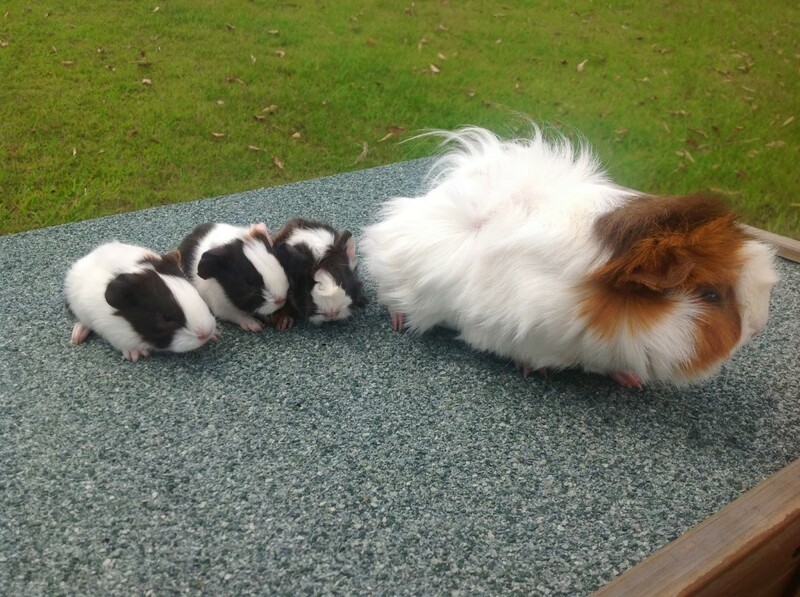 Guinea pigs are no exception and are actually in need of quite a few items that can take a chunk out of your wallet when you first get your new friend. Some are optional but recommended, others aren't that optional. A good sized cage is the most important thing to consider when looking at a guinea pig. It has to be large enough to fit all the cage accessories, and give him enough room to walk around and stretch. I've seen so many differing opinions on this dimension-wise but most agree the biggest is best, the spacing between the bars shouldn't be more than an inch apart, and there can be NO wire bottoms. The size I would go with is one that is at least 24 inches long, at least 16 wide, and 14 high but that looked uncomfortable with one of those large igloos in it. If you get one of the smaller cages, make sure you take out your little guinea pig for play time often. A water bottle and food dish are also extremely important as they give your guinea pig access to two of the most important things in his diet. Both should be cleaned once a week and the contents changed daily so he has fresh water and food. My guinea pig liked to try tipping the food bowl, so I was glad I decided to get one of the ones that don't tip and you might want to look into it yourself. The water bottle and food dish may come in a starter kit with a cage if you find one that is the right size of a cage. A salt wheel is also important to give your guinea pig minerals he doesn't receive in his diet of pellets and hay. They can be found for a few dollars for a set of two or three and last quite a long time. All you have to do is clip the wheel into the clip it came with and then clip it onto the side of the cage where the pig can easily reach it if he wants it. 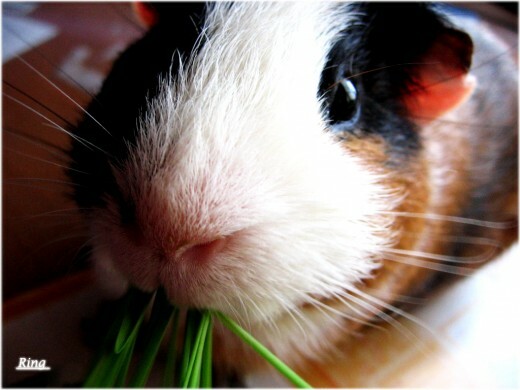 Hay is another important part of your guinea pig's dietary needs. Alfalfa hay is the hay of choice for guinea pigs younger than one year or ones that are pregnant, if it's older than one year you should feed it Timothy hay. Hay can be placed either on the floor of the cage, or in a hay rack. I chose a hay rack since it keeps the hay out of possible bathroom zones and is less of a mess to clean up every day. Bedding is important as some kinds can potentially harm your new guinea pig friend. Wood chips and shavings are the best choice, although they have those fluff kinds now you should look at what the effects of those are, I believe they are safe but have no personal experience using them. Avoid Cedar chips as they can cause liver damage and respiratory damage to the pig. Pine is best and the one I use, relatively inexpensive and can even be found in large bags for dog kennels at a cheaper price than the small bags. Food is necessary of course since it keeps the pig fed and alive. 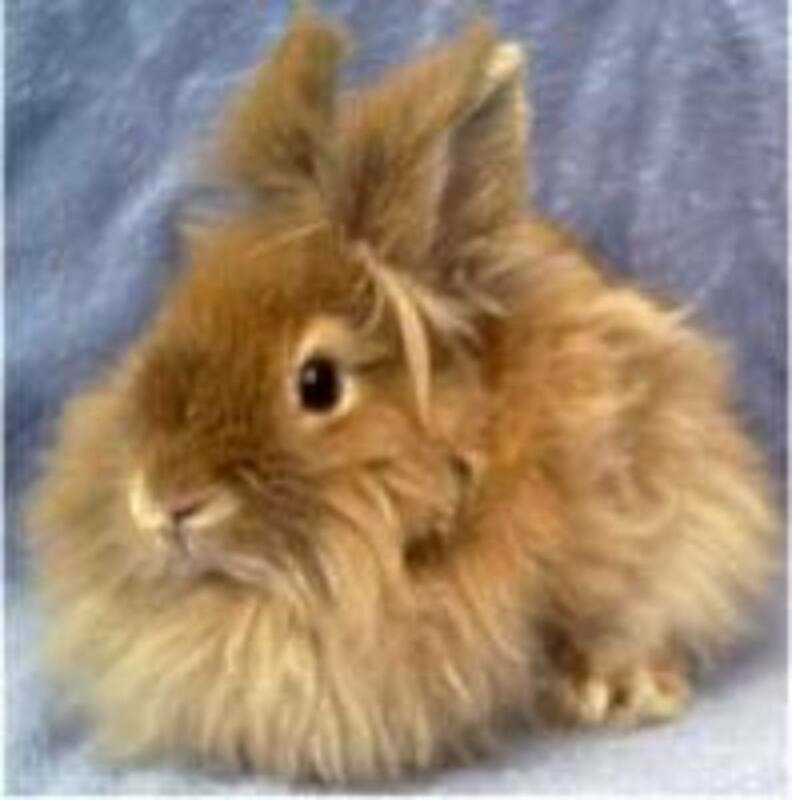 Buy only guinea pig food, NO RABBIT PELLETS! I didn't buy the kind with little bits of corn and such in the bag because they are processed and I didn't think they would be as good for the guinea pig as fresh foods, regular pellets are just fine as long as he also gets his water, hay and fresh greens. A hiding place is essential for a guinea pig to feel safe and secure in it's new home. Guinea Pigs like to have a place where people can't see them, after all how would you like to be on constant view of everyone with nowhere to hide? A simple box house can be bought reasonably inexpensively at pet stores or you can get a plastic igloo, just make sure it will be able to fit the guinea pig comfortably even when he is fully grown. Finally, the optional item Toys. Chew sticks and other guinea pig toys are a good idea as it encourages them to chew on that instead of your furniture or their cages. Make sure they are safe for guinea pigs though as some toys are painted with toxic ingredients even though they are 'guinea pig toys'. Wood scraps that are unfinished and clean make good chew toys and if you have someone who throws them away you can instead get them for free. Toilet paper rolls and shoe boxes are also great just make sure they don't get stuck in anything. 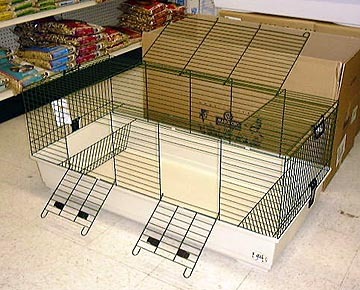 On the Side here is a cage you are most likely to see in a pet store, although smaller ones will only have one side door. They sometimes come in different colors for different sizes but don't let color be the deciding factor. Size is important to the guinea pig and he wants to have room to stretch and scamper around, he isn't going to care what color it is. If by "diet food" you mean its for pigs on a diet, you probably shouldn't feed that to them. Just because a pet store sells it, it doesn't mean it's good for them. Regular pellets are just fine, hay and greens should be the main chunk of what they eat anyway. If they are gaining weight, play with them more and don't feed them as many treats. They should always have access to hay and water though, don't keep them from those to keep them from getting too fat. If the vet told you to have it eat that stuff, I'd ask them. My guinea is named BellaElla she is like not eating guinea pig diet food. Any solutions? 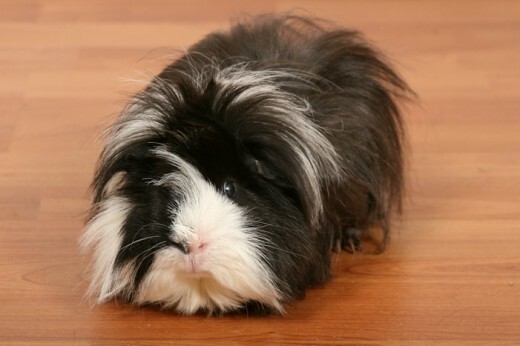 Good, solid information on what you need to give your new guinea pig a safe and comfortable home. Voted up and useful.